Now here is another one of Bobs Costume Creations. 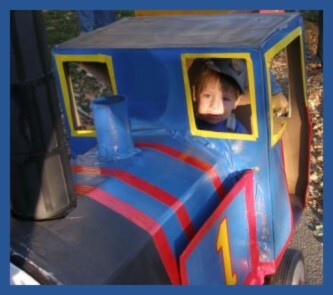 This is Jacob (2.5 yrs old and cute as can be:-), another of Bobs "creations"..Ü..and he's having a blast driving Thomas the Train that was built by, none other than, his Dad Bob. Bob tells me that this one was pretty much Cardboard, Tape (I think he said COLORED tape also), and Paint. (And LOTS of determination and skill?). The base is a childs wagon. Bob says that the Smokestack is part of a broken down "Grass/Leaf Blower". This Costume will probably take some time and patience. Hopefully the Pictures that Bob provided will be a good enough BASIC guide to get YOUR creation on it's way. The making of one of these "Cardboard Sculpted" Costumes can be quite a task. I have not, as yet, seen a place to PURCHASE costumes of this type and if there were something like this out there to buy I am certain it would be quite costy. 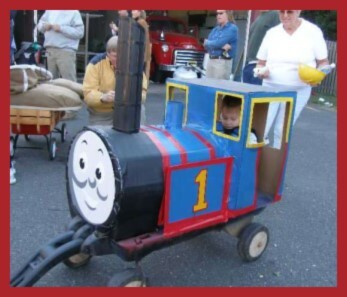 Then there is the fact that some of these types of Costumes are "Vehicles" of some sort which the driver may wish to "park" and GET OUT OF at some point. You may wish to come up with your own, homemade "uniform" to go with the Vehicle to complete the Costume... which I am sure many Costume makers can do without much problem. If you, however, find yourself short on time and/or energy (not surprising after all of the work with cardboard and tape Ü) You might just want to visit one of my favorite On Line Costume Stores and see what is available. In some cases the purchase of a Costume... or a "partial" costume, as would be the case here...may save you MUCH on time and wear and tear. As you may notice, the cost of Materials to make a costume...may be more than what you could/would pay for a costume already made. Just a thought.